Score some points with these Touchdown JELL-O Poke Cupcakes. The JELL-O poke cupcakes are decorated with footballs for a perfect game-day treat. Prepare cake batter using the egg white version, and bake in 24 paper-lined muffin cups as directed on package. Cool in pans 15 min. Pierce cupcakes with large fork at 1/2-inch intervals. Add boiling water to gelatin mix; stir with whisk 2 min. until completely dissolved. Spoon over cupcakes. Refrigerate 3 hours. Frost cupcakes with COOL WHIP. Draw footballs on cupcakes with frosting. Use decorating icing to draw the laces. Omit chocolate frosting. Frost cupcakes with COOL WHIP. 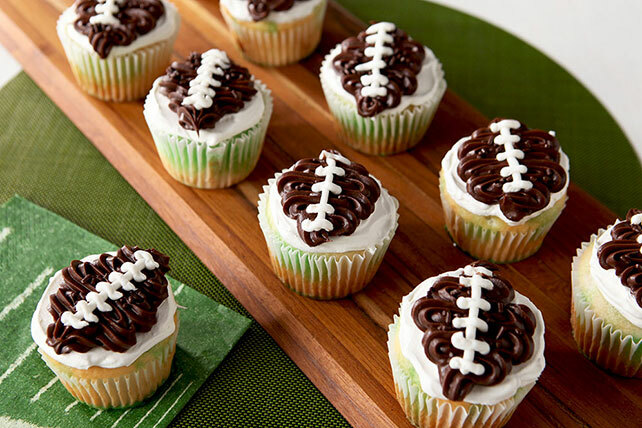 Draw footballs on cupcakes with colored decorating icing; decorate with 1/4 cup chocolate sprinkles. Decorate cupcakes with sprinkles the colors of your favorite football team.